I love this. 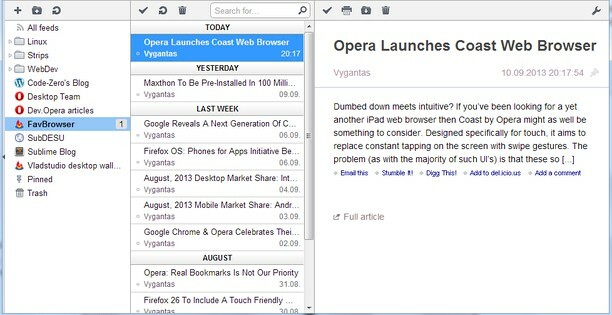 And the big inconsistency here is that this extension only simulates Opera's original news reader that they removed. The only logical thing here is to rebuilt this feature just like it was: on a web panel so you don't even have to leave your current page to see the news. It was practical, fast and you could organize your feeds the way you liked. I never understood why they removed something like this. Oh, and it could fetch your mails also. Damn it was useful. Hello, we are reaching 2016 and Opera can't play Twitter videos. What a shame. 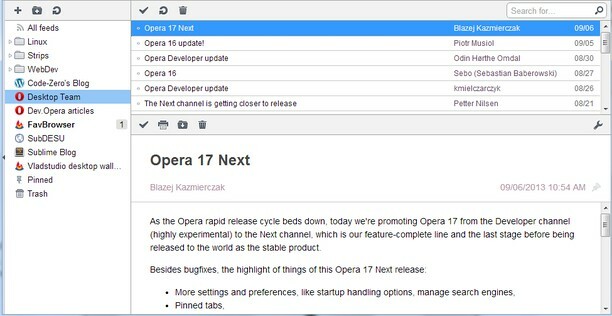 With Opera 28.0 on Xubuntu 14.04.2 with Flash installed it does not work. So, we are in 2015 and nothing has been done about it.Looks like Opera tells Vine to send the contend in mp4 but can't read it, while it should tell vine to send the content in adobe flash. RE: Is possible to use Java on Opera yet? Is possible to use Java on Opera yet? Hello, I would like to know if I can use the Java plug-in on opera, just like on Firefox. It is very useful to access banks websites here. Have it been implemented yet? Anything about the 32 bits version?? I know this problem. Unfortunately, the only fix I know is reinstall (but it can happen again anytime). Sadly, we cannot hope for a correction, due the circumstances. RE: Where is the Portuguese forum?